It doesn’t take us long to see events with people in the bible that also had this issue of not being able to keep the “never’s” they promised, I’m sure Adam never intended to eat of the fruit of the tree of the knowledge of good and evil, Moses probably never intended to one day go back to Egypt, David never thought he would be guilty of adultery and murder. Peter said he would never deny our savior but one evening he not only did it once but three times just as Jesus said he would, and Saul of Tarsus never had any intention of one day becoming a Christian. We are all familiar with the scripture in Hebrews 13:5 about how He will never leave us nor forsake us, but God has many more Nevers that we need to be thankful for. He told the Samaritan woman in John 4:13-14, “Jesus answered and said unto her, Whosoever drinketh of this water shall thirst again: But whosoever drinketh of the water that I shall give him shall never thirst; but the water that I shall give him shall be in him a well of water springing up into everlasting life.” He told Martha the brother of Lazarus in John 11:25-26, “Jesus said unto her, I am the resurrection, and the life: he that believeth in me, though he were dead, yet shall he live: And whosoever liveth and believeth in me shall never die. Believest thou this?” We are guilty of changing at seemingly every switch of the wind but Jesus Christ is the same yesterday, today, and forever! Jesus Christ ascended into heaven almost two thousand years ago and He told His disciples that He went to prepare a place for us and will return one day to bring us to live with Him forever. One last never I would like to remind you of is found in 1 Corinthians 13:8, “Charity never faileth…” Love never fails, His love for us is beyond what we can imagine and it Never, Never, Never fails! 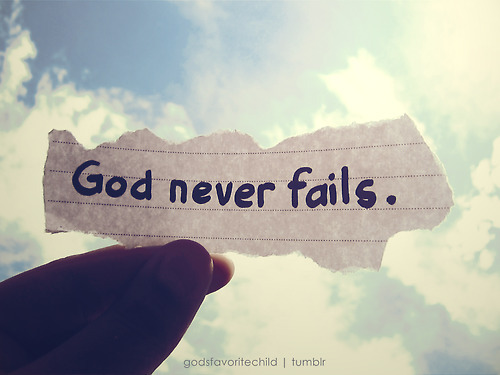 Thank God for His “Never’s”.